Powerful sound & intricate technique make Said El Artist Egypt's most popular drummer. He has collaborated with Arab superstars such as Mohamed Abdel Wahab, Wadi Al Safi, Amr Diab, Warda, Hakim, Samira Said and others. The Egyptian Cultural Ministry recognized Said's talent by awarding him the title "King of The Drum". 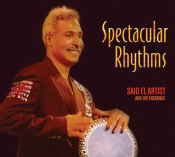 Spectacular Rhythms features exciting performances by Said El Artist and his Ensemble.